Nestled between the categories of tiny portable projectors and huge fixed-installation powerhouses is the Hitachi CP-X400, a 3000 lumen no-nonsense multimedia projector that is ideal for large conference rooms, classrooms, and meetings. With top-notch performance and a razor-sharp picture, it's a steal at $1500. Light Engine: 1024x768, native 4:3, 0.6" 3LCD with a 220W UHB lamp. Connection Panel: Two 15-pin VGA inputs, one VGA monitor output, one set of YPbPr component inputs, composite video, S-Video, two 1/8" audio inputs, one set of RCA audio inputs, one 1/8" audio output, USB, one 9-pin d-sub control port, one Kensington lock, and one locking hardpoint. 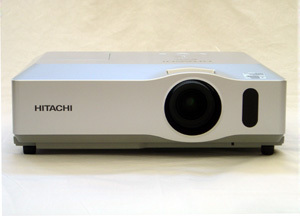 The Hitachi CP-X400 is a midsized projector, weighing in at 7.7lbs and measuring 13.5" wide by 10.75" deep by 4.5" tall. It has a recessed and slightly offset lens assembly that does not require a lenscap. The projector has a matte silver finish that is elegant, yet subdued. A removable panel on the top of the case allows access to the lamp. A left side panel also permits access to the air filter. So all regular maintenance on the CP-X400 can be performed without having to take it down from a ceiling mount. On the top of the projector is a hardwired control panel with just three buttons: Power, Menu, and Input. The menu button is multifunctional, with a press in the middle bringing up or hiding the menu and a press on the four sides moving the cursor. This type of setup works better with a larger button and it takes some practice to avoid mis-clicks. The CP-X400's connection panel is located on the rear of the projector and offers a good selection of inputs. Along with two VGA ports and a monitor passthrough, the CP-X400 has a dedicated three-RCA component input for video. While it is by no means a home theater projector, it can double as a home video projector should push come to shove. The only notable omission is a digital input, either DVI or HDMI. In addition to the standard Kensington lock point, the CP-X400 also features a hardpoint for a cable lock. This makes it ideal for use in classrooms or public locations, and grants peace of mind that no one will be walking off with your projector. The CP-X400 has no lens shift, which is not unusual--lens shift is not normally found on portable data projectors. One potential problem is that the CP-X400 throws the image such that a small portion of the image (about 7% of the image height) is below the lens centerline. As such, placement on a conference room table will throw the image lower than you'd typically want it. In order to get the image higher on the wall, you need to either elevate the placement of the projector itself, or tilt it upward with a resulting trapezoidal effect. This can be corrected with keystone adjustments, but that is not always desirable for detailed text and spreadsheet material. Similarly, ceiling mounts will likely require a drop tube if you want to avoid using keystone correction. With a 1.2:1 zoom lens, the Hitachi CP-X400 can project a 100" diagonal 4:3 image from 9.8 feet to 11.7 feet. This presents a limitation to those wishing to use a rear shelf mount, or to project from the rear of a conference room. Combined with the fixed throw angle, the ideal mounting situation for the CP-X400 is likely to be a ceiling mount with a drop tube, to bring the image down further on the wall. Vertical keystone correction imparts a bolded look to text, though it does not impair legibility. In fact, text down to 8 point size was still easily legible. However, when using a screen completely full of text, such as a word processing document, the bolding effect of the keystone correction is inconsistent, creating horizontal bands of bold and less bold sections of the document. This effect does not manifest itself when using most web pages or PowerPoint documents. So while using keystone correction is harmless under most circumstances, it is best avoided when displaying text documents and spreadsheets. The menu system is divided into two sections, Simple and Advanced. The Simple menu contains some common adjustments such as "image mode" which cycles through predetermined settings useful for different projection environments. Advanced mode contains more user-adjustable settings such as color temperature correction. It is interesting to note that some settings, including the preset image modes, cannot be adjusted from the Advanced menu. The projector's remote control is busy, with many small buttons labeled in tiny white type. It measures roughly 5" by 2" by 1", so it is small enough to stick in a pocket. Range on the remote is excellent, and our test unit was responsive and quick out past 20 feet of range. As long as you have a clear line of sight to the projector, remote range should not be a concern. Replacement lamps for the CP-X400 cost a mere $299. With an expected 3000 hours of runtime per lamp, this works out to an operating cost per hour of only ten cents. Despite the CP-X400's high brightness, the fan is unusually quiet. Even in high lamp mode, the projector produced only a low hum. In low lamp mode, this dropped off even further, and is nearly inaudible from more than a few feet away. The CP-X400 is nothing if not a very bright projector. Rated at 3000 lumens, our test sample produced a maximum of 2849 ANSI lumens in "Daytime" image mode with the lamp on high. "Normal" image mode produced 2400 ANSI lumens and better color balance. Putting the lamp into low power or "whisper" mode drops output 30%, to 1697 ANSI lumens. This is enough power to light a screen in a small conference room easily, and the very low fan noise ensures that the projector will never be a distraction in a small space. The lowest number of lumens we obtained from our test unit was 954 ANSI in "Cinema" mode with the lamp in its low power setting. This gives the CP-X400 a good range of lumen outputs for various installations. A small conference room with little ambient light would be well served at the low end of the spectrum, while a room with upwards of 25 people and a good amount of ambient light would require the more intense 2400 lumen setting. Brightness was also fairly uniform across the screen. Our test unit measured an excellent 85% brightness uniformity, with the dimmest area of the image being the top left corner. However, this slight difference in brightness is barely visible to the human eye. The CP-X400 is capable of excellent color performance. Colors in data graphics were well-saturated and accurate. When displaying video signals, the projector held its own, making vibrant scenes come to life. Video games looked stellar on the CP-X400, with their eye-popping colors faithfully reproduced. When fed a native 1024x768 signal, the CP-X400 is sharp as a tack. Small details in photography and spreadsheets come through clearly. Furthermore, edge-to-edge sharpness is near perfection, for a crystal-clear image in every corner and at every edge. With non-native signals, the projector is equally impressive. HD 720p content is compressed without undue loss of sharpness or detail, and the CP-X400 could easily serve a secondary role as video game projector or a movie projector on weekends. The Hitachi CP-X400 is a powerhouse of a projector, outputting nearly 3000 ANSI lumens from a 7.7 lb. package that sells for roughly $1500. In terms of bang for the buck, it's hard to match. While it has somewhat restrictive lensing and can be hard to mount in some situations, it is an impressive multimedia projector, suitable for use in conference rooms and classrooms large and small.